With the progress of human civilization, cloth is no longer for protection against the cold only.Cloth is to make up and embellish one’s appearance and shows one’s taste. Therefore, we wish to use the simplest way to distribute the purest texture to consumers under current recession. 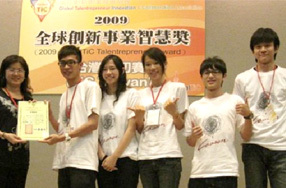 Focusing on young people’s desire in chasing for changes, Kaasan Internet DIY T-Shirt studio formed Kaasan design team in 2009. Using white T-Shirt as the basis, designers launch galleries without a fixed schedule to let customers style their own T-Shirts freely. To let fashion and simplicity be combined together—a pure white T-Shirt can become many different kinds of styles then. With the concepts of “originality, convenience, and quality,” Kaasan utilizes virtual internet office instead of unnecessarily well-decorated office. It expects to let everyone have a stylish and “original” T-Shirt. al materials. With the visual aids of programs, customers are able to make up their own T-Shirts online. And the computer program automati cally memorizes the T-Shirt patterns designed customers online, and send the files to the production department. The service of the company is to transfer print on T-Shirts for customers.